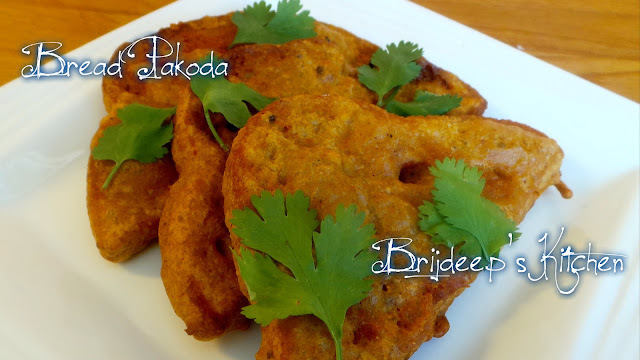 Bread Pakoda has always served as a very quick and easy breakfast or snack option so many times in life. 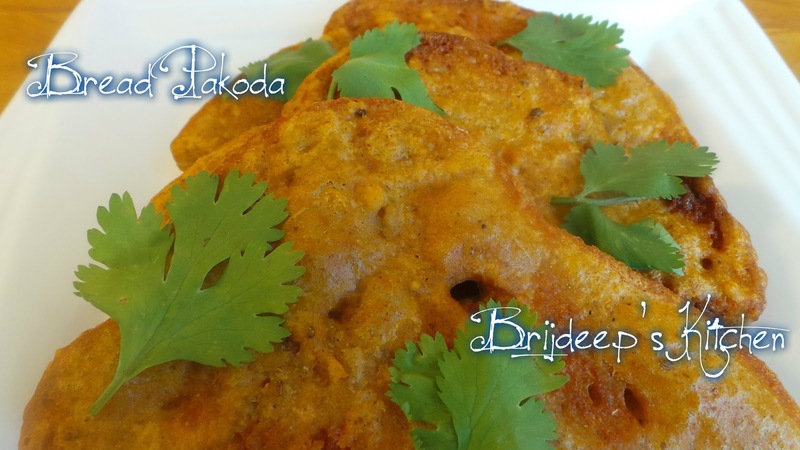 The most wonderful thing is there is no specific way to prepare it other than make batter, add spices, dip in bread, fry and enjoy! This is perfect for the rainy days with a steaming cup of chai! It has been my savior on those dull Sunday mornings when I'm not in the mod to prepare anything elaborate. 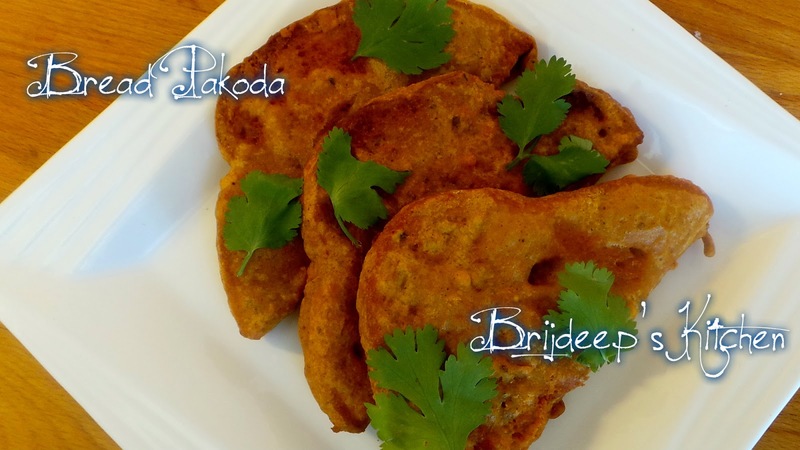 Bread pakoda comes to rescue with its crunchy, mildly spiced flavor which can be served with green chutney or sauce. Also perfect when you have guests over: just buy a pack of bread and impress them in just 15 minutes !! Cut all the bread pieces diagonally in two parts each. Keep aside. Take gram flour in a deep, big bowl and add all the dry spices in it: red chilli powder, cumin powder, coriander powder, mango powder, kasoori methi, garam masala, carom seeds, and salt to taste. Mix with enough water to form a paste which should neither be too runny nor be too tight. It should easily be mixable with a big spoon/spatula. Mix well. Heat oil in a deep pan (kadhai) on high flame. Let it hot for a few minutes. Test the hotness of oil by putting just a bit of the gram flour paste in the oil carefully without spilling any oil upwards. If the bit gets cooked quickly and comes up, the oil is ready. If the bit stays down and reacts very slowly, then perhaps you need a few more minutes. If it becomes too brown and crispy, turn the heat to medium for a while, because that means the oil is too hot. 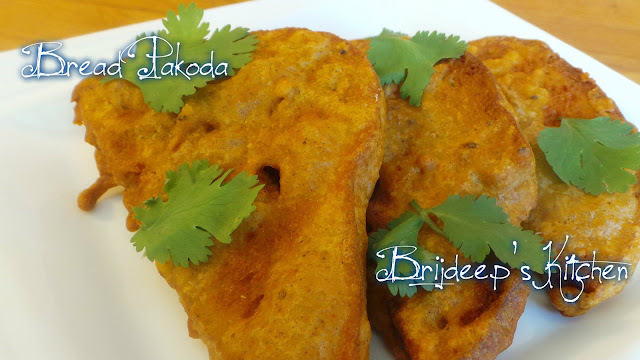 Now take the diagonally cut pieces of bread and dip it completely and quickly in the gram flour paste you made. If you keep it for a while, the bread will crumble and give away: it will get mixed in the paste. So mix and take out the bread piece quickly, and very very carefully, lower it into the hot oil. Let it cook for about 20 seconds. Turn to the other side. Repeat. It should look like a darker tone of yellow: between the yellow and dark brown. It should not turn red (overcooked). Remove when cooked and put it on a tray covered with tissue paper to absorb any extra oil. Repeat the same with all the bread pieces. You can put two at a time, depending on the size of your pan. Garnish with freshly chopped coriander leaves and serve immediately with green chutney/tomato sauce.